I've just received this award all the way from West Yorkshire, England! Lyn, from Everyday Life, passed it along to me. I happen to love England, (Bill and I traveled to London, Stratford- upon-Avon, through the Cottswolds and on to Bath, several years ago), and Lyn's blog is full of lovely photos which I find enchanting. Lyn, thank you so much! are the ones I check on almost every day! Everyday Life - lovely scenes of England, lovely gardens! Sew and Sow Life - Karen writes about her family, life in Vermont, inspiration, nature, and art quilting! Stegart - Terri is one very talented mixed media artist! She shares her work and offers classes through Two Creative Studios, along with fellow artist Sue Bleiweiss. Sparkle Jars - Gayle's quilts are lovely and she often links to great music! Teatime and Roses - this is one special lady, my friend Beverly. She has gorgeous photos of flowers and makes beautiful paper art. Linden Grove - Again, Simone has great photos of England, and a link to her other blog, Mutant Trees, on which she posts her lovely artwork! Furry and Feathered Friends - Nan is a watercolor artist and photographer whom I truly admire. On this blog she shares little stories about the critters in her yard and her beautiful cats. On both this, as well as her other blog, Shells and Roses, there are photos of the Maine coast, interspersed with some of her delicate watercolors. Art Glehen - Helene is a French, self taught painter who does exquisite watercolors and oils. Visiting her blog is like spending time in a beautiful gallery. Swan of Dreamers - Shell is an actor, and a self described 'free spirit'! She posts about film, literature, positivity and dreams. I read many other blogs and, if I haven't linked to you it's because I'll never get this posted if I continue! I know many people choose not to accept or pass on awards, but just know that your writing and work is appreciated! Please visit these talented people if you get a chance! I've been working on this new piece, a combination of applique and machine embroidery. 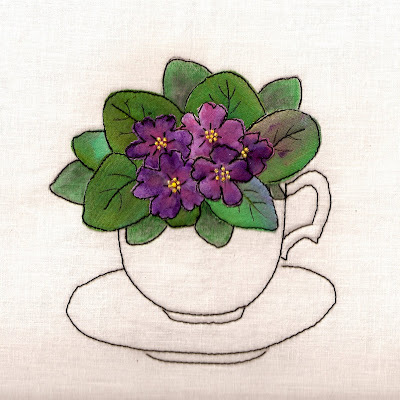 The violets are cut from handpainted fabric, as well as some of the leaves. The underlying leaves are outlined with stitches and 'painted' with watercolor colored pencils. I have more details to add. Hope to have it finished by Friday! Very wet and soggy here!! Looking forward to seeing sun again before the end of June!! Since I'm being so slow at posting a new fabric picture, Kristy wanted to put her two cents in and say hello! There is a new picture over at my other blog, if you want to take a look! Well, my blogging break has coincided with a bout of illness which I'm just now getting over. Stomach problems - 'nuff said!!! The good news is that I've been keeping close to home and finally accomplished something I've been wanting to do for a long time - starting a new blog!! I've decided to keep Fabric Art & Crafts true to its title, and my new blog, Paper Perks, devoted to the paper arts. So far, it is still a work in progress, but I'm pretty excited about it! This paper cut is part of a picture I did a while back, called Nature Filled. I'll be posting a new fabric piece soon, and I invite you to take a second to pop over to see my new site! to get some work done. and getting lost in a project or two. attempted to tame our wild hedge of forsythia. I thought I'd tell you about a terrific blog called Craft Gossip, written by Denise Felton. I'm pretty excited to say that my work has been highlighted three times in the Needlework section of this blog - most recently here. 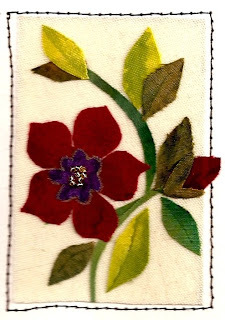 I've come to discover that this blog covers every type of needlework imaginable, along with patterns, tutorials and some very unique ideas! Here is a tutorial ( my first) on how to make the lace bird shown in my last post. You'll need scissors, a pencil, a needle and thread, glue, and either white cardstock and a paper doily (left), or white stiffened felt and a piece of white lace (right). On the back of the felt or cardstock, draw this pattern (leaving space around each shape), or any bird shape, and two wings, and cut out the inside of the shapes. Now cut about 1/4 inch (or less) around each outline, being careful not to cut into the outline, to create a "frame". Here's the cut-out frame and one wing, but don't forget to make two wings! Apply a continuous line of tacky or paper glue to all frames, and flip them over onto the lace or doily, capturing your favorite motifs. It's a good idea to put some plastic or parchment paper under the lace to catch excess glue. Let the glue dry and trim carefully around the outer edge of the frames. If you want to put two or three in one window, you can arrange each bird's wings differently and vary the angle at which each is flying. If anyone makes a bird following this tutorial, I would love to see the results!